Discoveries like the fossilized bones of an 8,000 year old jaguar and 50,000 year old grizzly bear only add to the cave’s allure. And that’s what draws us to explore these subterranean landscapes: the mystery of what we might find. The trip to the remote mountain caves begins in a valley. We travel along Redwood Highway, the sparsely populated Illinois Valley cradled on all sides by the green slopes of the Siskyou Mountains, just north of the California border. The morning sky is over-bright with a desert-like chill lingering in the air. It promises to be a perfect summer day, ideal for descending into perpetual darkness where the temperature is about the same as a refrigerator. I crook my arm to absorb the sun’s rays while I can. We enter the city limits of aptly named Cave Junction, Oregon, population 1500, last stop for fuel and commerce. I survey the one-street town center; glimpse a disappearing slice of Americana. The strip is at once both quaint and neglected, evoking the simultaneous feelings of nostalgia and sadness. We top off our tank (like New Jersey, you can’t pump your own gas in the Beaver State) and then top off our stomachs at Taylor’s Sausage Country Store, a local institution with roots dating back to 1924. Full of eggs, house-cured bacon and curiosity, we head for the hills. 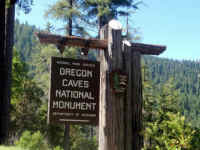 It’s only 19 miles along Caves Highway from town to Oregon Caves National Monument, but plan for an hour trip—in fair weather—as you negotiate the serpentine switchbacks that mark your ascent. The trip isn’t half as harrowing as the Road to Hana for comparison, but still receives a white-knuckle rating of 5 for first-timers. On the plus side, don’t worry about getting lost. If you stay with the twists long enough, Caves Highway dead ends in the Monument’s parking lot. My ears pop as I exit the car. The caves are located 4,000 feet above sea level, which seems counter-intuitive to underground exploration, but who am I to quarrel with the wonders of nature? An access road leads us to the visitor’s center and the adjacent rustic Chateau, a vintage 6 storey wooden structure built in 1934 that offers a charming overnight experience for those willing to accept a lack of some modern amenities; the hotel has no elevator, for instance. 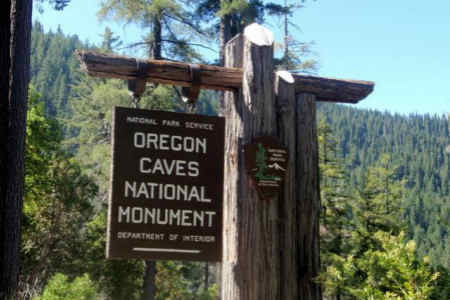 Oregon Caves National Monument was set aside by President Taft in 1909. Its nearly 500 acres include the caves themselves as well as four surrounding nature trails that wind through old-growth coniferous forest. 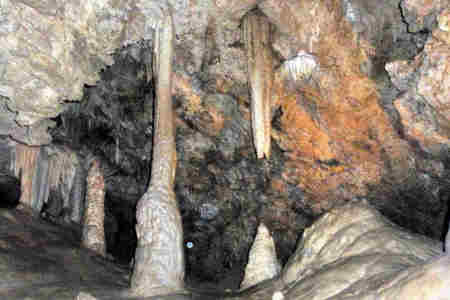 Discovered only in the 1870s the caves are thought to be between 3-5 million years old and possess many unique features like an underground creek whose waters flow unobstructed to the ocean, and stalactites of various size and colour, with some forming floor to ceiling columns. Formations of all three rock types are on display, with bits of igneous rock and sedimentary limestone interspersed with immense sheets of well-veined marble (metamorphic). Discoveries like the fossilized bones of an 8,000 year old jaguar and 50,000 year old grizzly bear only add to the cave’s allure. And that’s what draws us to explore these subterranean landscapes: the mystery of what we might find. The guide kills the dim canned lights running along the path. The sensation of temporary blindness slowly settles in as my eyes try and fail to adjust to light that isn’t there. The sensation of displaced air is the only way to know that I passed my hand in front of my face. 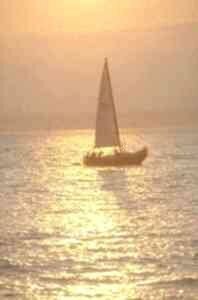 The sound of trickling water and my own shallow breath become prominent. I begin to detect the distinct scent of minerals in the moist air and almost imperceptibly I can “feel” the immeasurable mass of stone surrounding me. When the cavern’s nuances become visible again, they are jagged, erratic, perfect in their randomness. Some “rooms” in the cave are the size of a garden shed, others bigger than a movie theatre. All the colours of the rainbow captured on a canvas no one was ever meant to see. Dime-sized drops of sediment hang from fingers of rock (stalactites) in the ceiling, dripping onto their partner fingers (stalagmites), some meeting to form a shining column. In some places seepage slickens the walls, giving the rock the appearance of alien flesh. 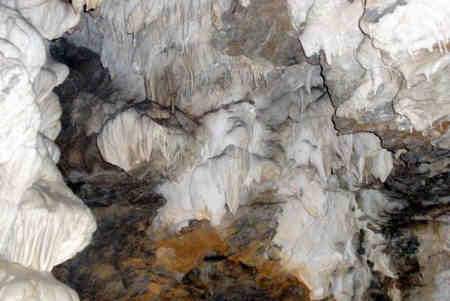 In others, entire caverns look like the remnants of an enormous melted candle. The caves are a testament to the artistry of nature, and like art itself, it is best left for each to interpret in their own way. We’re given a chance to leave the tour after 45 minutes. We decline. The wonders to this point have been great, and, like a movie, the tour saves its most fantastic sights for last. We emerge from the caves, momentarily disoriented like we just left a matinee. The first few breaths of mountain air feel as refreshing as a cool drink on a hot day. The colours of life more vivid than I remember, a feeling that resonated rather than dissipated over the ensuing hours. I left the mountain not surprised that I had a greater appreciation for the world below ground, but that I felt a greater appreciation for the world above as well. Such are the power of these caves. See also our article on Oregon. Click the camcorder symbol above to watch a video related to this destination. 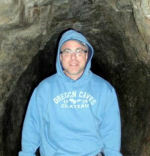 It is taken more outside the caves than in - tricky to film in near darkness!